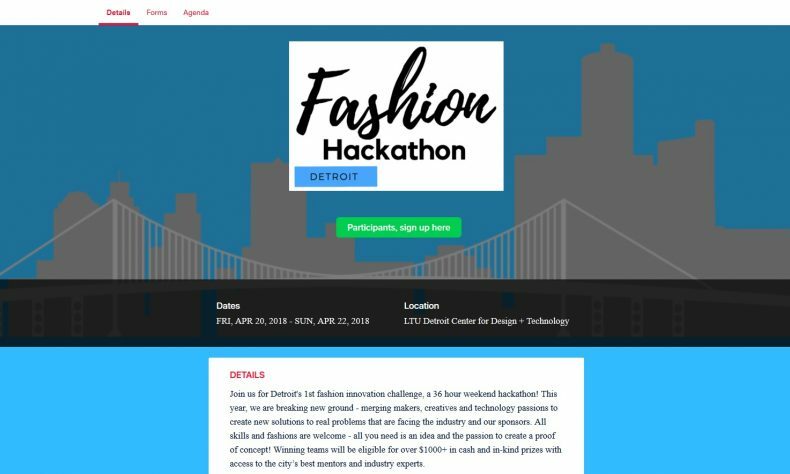 LANSING — Pure Michigan Business Connect, a small business initaitive of the Michigan Economic Development Corp., unveiled plans for a “Fashion Hackathon” April 20-22 at the Lawrence Technological University Detroit Center for Design + Technology. The event begins at 5 p.m. Friday, April 20 and concludes at 3 p.m. Sunday, April 22 at the center, 4219 Woodward Ave. in Detroit. It’s co-hosted by Whim Detroit, a technology developer specializing in brands in the apparel, athletic, retail and fashion industry. People can apply for the competition as individuals or teams. The format aims to involve six to 10 teams with two to five participants on each team. At least one person per team will be familiar with writing code. Other team members will include students or graduates in fashion, design, art; a retailer or entrepreneur; a product or data specialist; and a do-it-yourself maker of fashion items such as bags, scarves, or accessories. The teams will collaborate to solve a hypothetical market-based issue in the retail and fashion industry. Part of the collaboration requires developing web-based systems. The competition will be judged on the quality of participants’ responses, along with originality, scalability, creativity and practical application of the ideas. Cash and in-kind prizes will be awarded. In addition to the competition, there will be panel discussions, technical demonstrations, and networking opportunities with industry experts. For more information or to sign up to participate, visit https://pmbc.connect.space/detroit-fashion-hackathon/details.